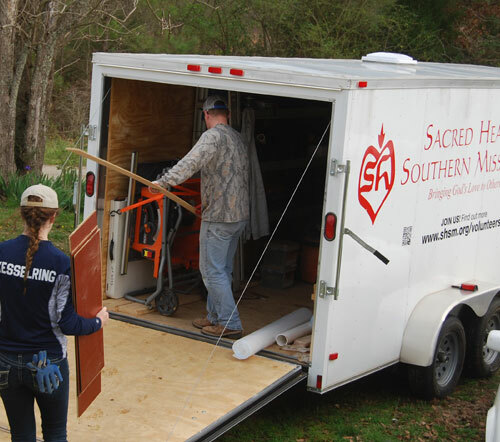 The trailers Brookings provided have made a world of difference in the amount of work each group is able to accomplish. No more waiting on materials or tools! Everything is right at our fingertips! 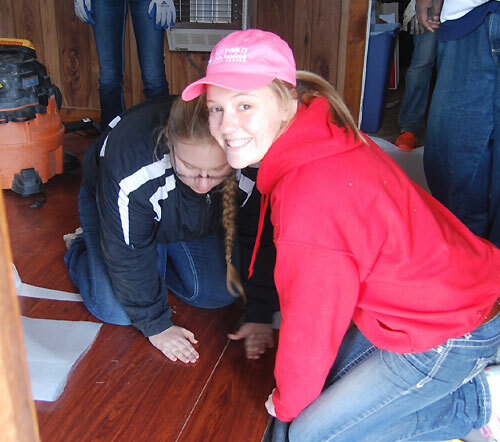 Volunteers with Brookings installed new flooring in the den and family room for an elderly disabled client in Coldwater. Brookings volunteers take a break from the work to snap a few pictures. 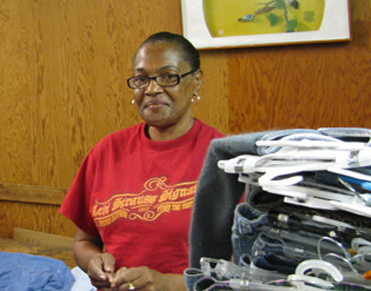 "The Volunteer Program has been in full swing with the advent of Spring Break. Four groups have joined us over the past three weeks. 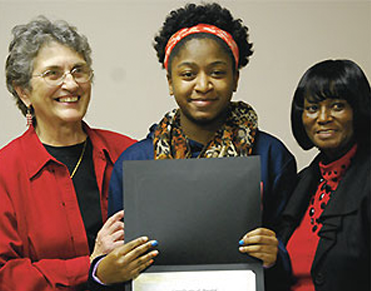 The fifty nine young people and their sponsors have ‘Marched’ through a long list of client projects." "To the credit of the program, all four groups are repeat visitors. Brookings, aka University of South Dakota at Brookings, made their way down the first full week of March. You might remember them from their wonderful donation of two work trailers last fall. 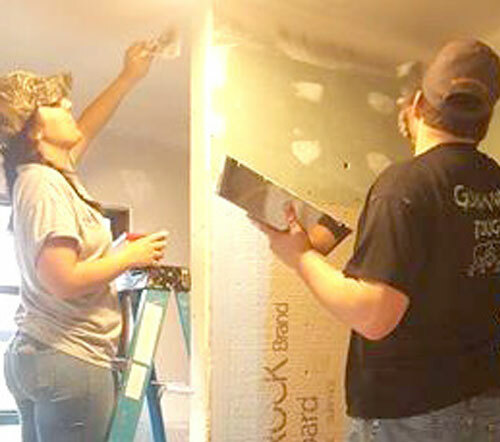 The fifteen college students were able to begin a long awaited roofing job in Hernando, tackle a flooring job in Coldwater and serve at the Garden Café before making the journey back to South Dakota." "Labor of Love, a group of about twenty-five teens from our local parishes, along with their working chaperones came in the Saturday after Brookings and spent the weekend painting and helping organize the Gift in Kind warehouse as part of their service retreat." 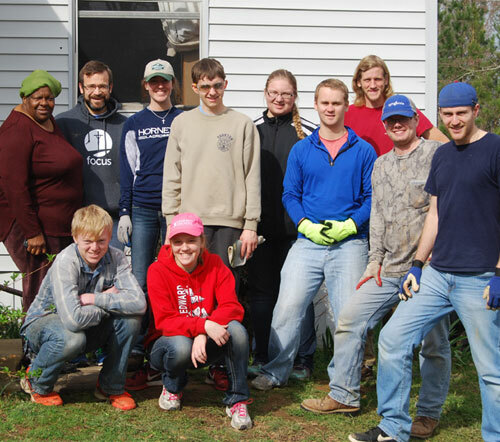 "On the heels of Labor of Love, twelve Ohio State volunteers joined us. 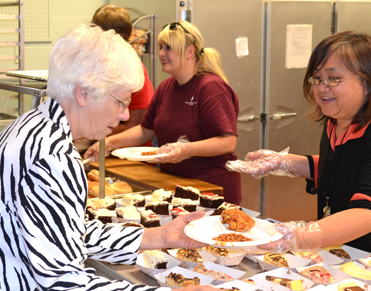 They began the week in Holly Springs at the mobile food pantry. While some team members bagged food and helped load groceries in clients’ vehicles, others were busy constructing a ramp to make the process of getting grocery carts to vehicles easier. 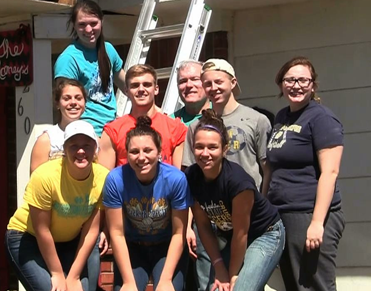 Over the course of the week, Ohio State volunteers were able to complete the Hernando roof which had been started earlier in the month. Also on their ‘to-do’ list was trim work, a bathroom renovation as well as painting and caulking for a client in Nesbit. The cold snap and damp conditions slowed the second project slightly, but it certainly didn’t dampen their spirits." "This week, Badger Catholic will pick up where Ohio State left off at the Nesbit worksite. According to SHSM Project Manager Paul Smith, the seven young people have made tremendous strides at the jobsite.